Dollar Shave Club is growing up, and consumers appear to be enjoying the process, according to new data from YouGov Plan & Track. In 2012, when the brand gained widespread recognition with its humorous “Our Blades Are F***ing Great” video (26 million views on YouTube), the business model was rather simple: subscribers received a regular shipment of razors in a box. Today, however, Dollar Shave Club, which was bought by Unilever in 2016, offers a variety of products, from shampoo to toothpaste to hand cream. As such, the company’s marketing has matured, as well. In early July, Dollar Shave Club launched a new ad campaign called “Get Ready,” which features a wide range of men and women, of various shapes, ages, ethnicities, and sexual orientations, preparing to begin their day. Since then, the commercial has received over 2,500 national airings, according to one estimate. 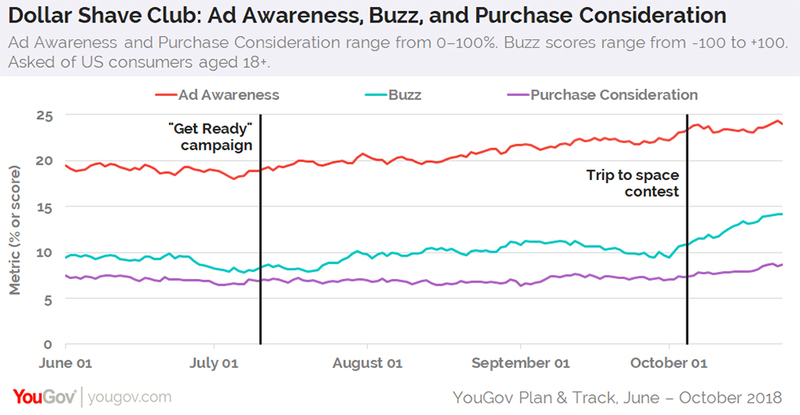 YouGov data shows that since the debut of “Get Ready,” the percentage of US consumers aged 18+ — both men and women — reporting seeing an advertisement for Dollar Shave Club has gradually increased from 19% to 24%. In that same time frame, Dollar Shave Club’s Buzz score — which asks respondents if they’ve heard something positive or negative about the brand in the past two weeks — has risen from a score of 8 to 14. More recently, in early October, Dollar Shave Club announced a contest that will send one random winner into space. The announcement coincides with the brand’s recent spike in Buzz score, along with a slight increase in Purchase Consideration, which asks US consumers aged 18+ if they'd be open to spending money on Dollar Shave Club when next in the market for the relevant consumer goods. On October 1, 7% of American adults showed interest in buying from Dollar Shave Club. Today, that amount has inched up to 9%.